Cade wakes to find himself prisoner of a cult, one that has chosen him to murder the Power Master himself. Their plan: to hypnotize him to betray his deepest beliefs. The plan fails, as the conspiracy has been infiltrated by someone hiding in shadows, someone who for some reason is assisting and protecting Cade. Cade manages to escape the cult. He must then evade recapture and report the conspiracy to his senior officers. This proves more difficult than expected, as he has been reported killed in action. The authorities believe him to be a dangerous madman pretending to be Cade. He is to be captured and turned over to the civilian authorities for execution … that is, if he manages to avoid being killed out of hand by his fellow Armsmen. Cade eludes his pursuers long enough to make contact with a official who will listen to him. Or rather, seems to listen to him. He is betrayed, and finds himself on the run again. Now, and only now, he begins to doubt the regime he has served so faithfully. If his seniors are self-serving voluptuaries, whom can he trust? If the Armsmen can be corrupted, if such a pillar of his world is a lie, then what grand cause can poor Cade serve? I first read this novel as part of an Ace Double. Hmm; based on the publication date, I think this must have been the first time I read anything by H. Beam Piper. 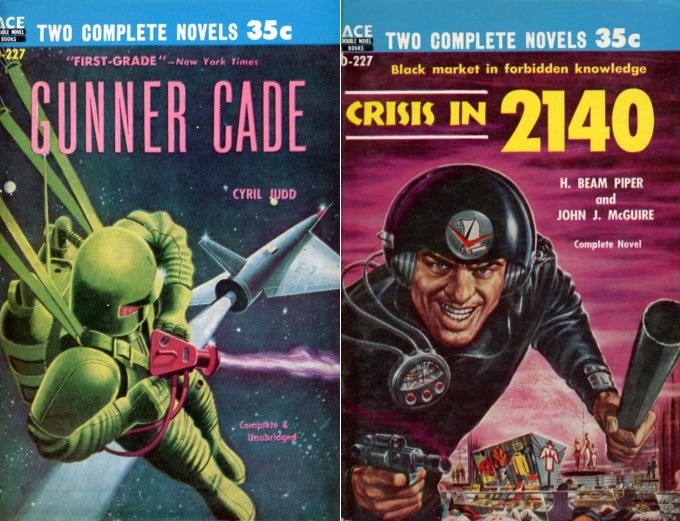 I have no memory of Crisis in 2140 at all. I’ve long since misplaced the original book. Which is probably all to the good, as I am not really sure how I would review and file such a curious artefact. In a format that no longer exists. Which is odd, really. Ace managed to sell books in that format, but nobody else seems to have duplicated the feat. Cade seems as dumb as box of rocks. A lot of effort has gone into making him inflexible and incurious, because the imperial order depends on the people holding the lethal weapons never asking inconvenient questions. For that matter, there are whole modes of warfare the empire has been designed to prevent. No nuclear apocalypse if the military considers conventional warfare the only possible method. Anything else is just not done . To its credit, the empire seems to provide most people with livelihoods and security. Armsmen appear to be the main outsiders to this stodgy utopia; they are encouraged to embrace short, thrilling lives and glorious honourable deaths. Their military code seems to have prevented them from seizing actual power, which they are well placed to do. It’s only after hundreds of lifetimes that some of the unintended consequences of the founders’ choices are coming back to haunt the imperium. It’s rapidly depleting the last sources of atomic energy and the stagnant, hidebound science of the time is ill-equipped to come up with substitutes. Oh well. Ten thousand years is a pretty good run for a society. As for the actual story … it moves fast and does not overstay its welcome. 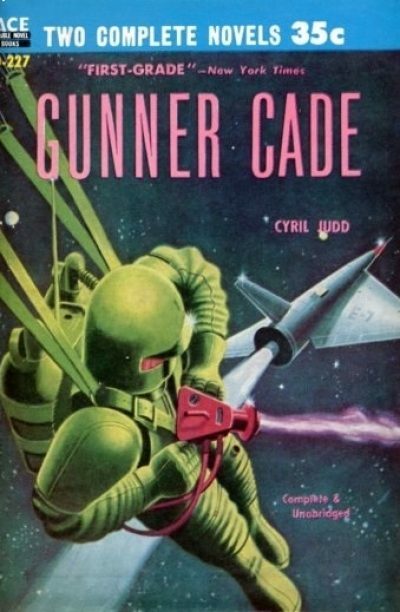 The plot is very straightforward, the plot twists are predictable, and the characters are for the most part stock figures that would been familiar to the SF readers of 1952, when Gunner Cade was first serialized. Perhaps the one thing that surprised me on this reread is that the women in this novel actually have agency. Their choices drive the plot. Without them, Cade would have had the short, glorious life he had expected. That would have made a grimmer ending for the book, but one that Cade himself would have preferred. Gunner Cade is included in the omnibus Spaced Out: Three Novels of Tomorrow, available here (Amazon) . It does not appear to be available from Chapters-Indigo. 1: Why not military SF? Because I don’t think there was such a thing until the 1980s. This is at best proto-MilSF.